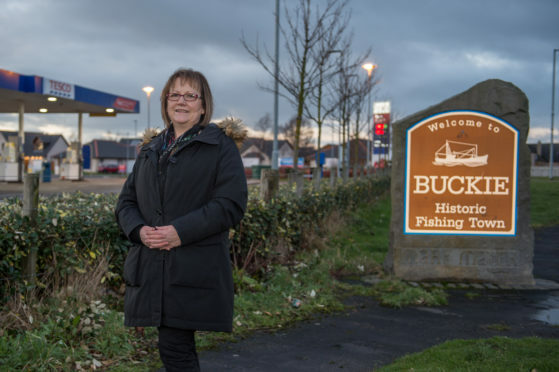 Picture by JASON HEDGES Pictures show Councillor Sonya Warren pictured at the entrance to Buckie, Moray. But the exact nature of Buckie’s new gateway feature is the hands of artists across the UK. They have been challenged to create a unique artwork that captures the heritage of the coastal town. The task for local, new, emerging and established UK-based artists will be to create an installation that will welcome people to Buckie, have wide appeal and link to its history. It is being paid for through developer obligations from supermarket giant Tesco – monies that are due to run out next year and so must be used as soon as possible or be handed back. Funding has been ringfenced for the gateway project, together with a woodland development, while money should still be left for other, smaller, community proposals. Buckie councillor Sonya Warren is excited to see what kind of ideas are put forward for what could become an important flagship attraction. She said: “We want local artists or any artists to come up with their interpretations, whether that is a metal sculpture or a wood carved statue. It has taken a long time for council officials to decide where the gateway feature will go due to road safety issues, but a location for it has now been agreed. The £23,500 installation will be erected just off the Tesco Roundabout when entering Buckie along the A98. More than £400,000 was received in developer obligations from Tesco in 2010 with £300,000 of this already invested into the bus service, improved traffic signals and town centre projects including Christmas lights, Buckie’s Christmas Kracker, the Fishwifes Path and the ‘There But Not There’ Tommy commemorative sculptures. There is £43,000 left for community projects, with Buckie locals invited to offer their ideas about how to spend it at a drop-in event on Tuesday February 12 at the Fishermen’s Hall, between 4pm and 7pm. Recent Moray competitions have shown the power of design to provide a focal point for communities capable of arousing discussion. The divisive but undeniably eye-catching Dandy Lion sits in the centre of Elgin, melding together numerous nods to the town’s industry, pastimes and attractions past and present. Proposals must be entered in an electronic format to procurement@moray.gov.uk no later than 5pm on Friday March 29.